Sarah Walk releases brand new song and music video 'CTRL'- an empowering release about fighting against the male establishment. I hope this finds you well. I wanted to send a quick update on some exciting things going on over the next few months. First, I will be playing at the Diva Music Festival in England on Sunday December 2nd. It's a 3 day festival with some amazing artists and some tickets are still available at divamusicfestival.com You can buy a pass for the whole weekend or for just one day. I'll be hitting the stage at 4pm on Sunday with a full band! Also, I'm so excited to share that I will be heading back to Germany this December for a 10 day tour! I'll be co-headlining with my friend and songwriter Adam Barnes and we'll be playing in 9 cities across the country. You can find more details and ticket links at my website www.sarahwalkmusic.com. And lastly, I have been cooking up a new release that I cannot wait to share with you. Keep your eyes and ears open early next year for this one..More details soon! 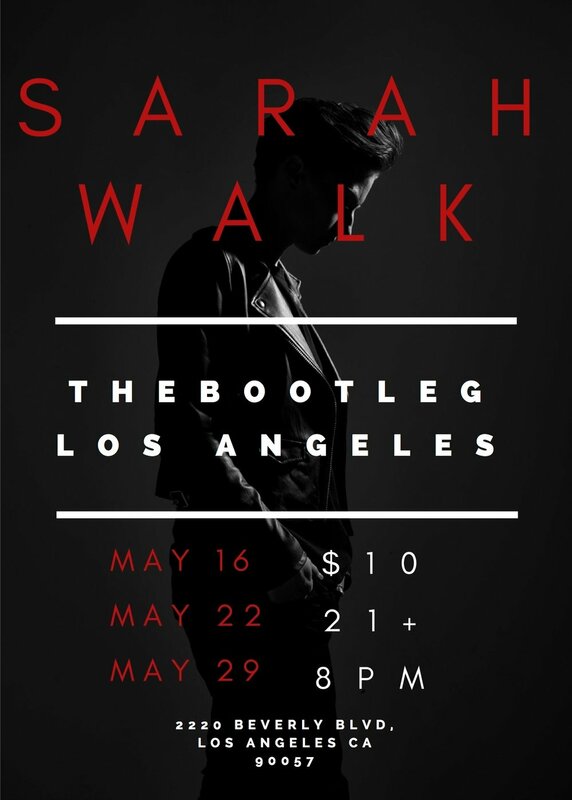 Cannot wait for my Los Angeles residency at The Bootleg in May. Come say hi! The debut album Little Black Book is out today! It has been a long journey that has led me to be able to share my debut album with you today. I am eternally grateful to everyone that has helped me along this path.. It is a dynamic and complex experience and I have tried to capture all of that on this album. Friends, I am so excited to let you know that my debut album 'Little Black Book' is now available to pre-order before the release on October 20th. You can go ahead and do so here. I am also thrilled to share with you a live acoustic video of the title track off my album, which was shot and recorded at the Church Studios in London. Watch the video here. All pre-orders will automatically get a digital download of this track from the album before it is released. Keep an eye out for the full track premiere tomorrow.